26th October, 2015 — ASUS today announced VivoBook 4K, an affordable mainstream laptop that delivers stunning 4K/UHD (ultra-high-definition) visuals with a resolution of 3840 x 2160 pixels. VivoBook 4K has an IPS display with wide 178° viewing angles and an ultra-wide 72% NTSC, 100% sRGB color gamut for accurate, vivid colors. It even features ASUS Eye Care mode to effectively reduce blue-light levels by 33% to ensure a comfortable viewing experience. ASUS VivoBook 4K can be specified with a 5th- or 6th-generation Intel® Core™ i7 processor with 8GB RAM (expandable to 12GB), and NVIDIA® GeForce® 940M graphics. ASUS VivoBook 4K delivers high-quality 4K/UHD visuals to the mainstream laptop segment, providing users with extremely detailed and sharp visuals at an affordable price. The 3840 x 2160 resolution display has 8 million pixels and a pixel density of 282ppi — giving it four times (4X) the pixel density of standard Full HD displays. This provides users with sharp, detailed visuals whether they’re viewing pictures, watching movies, or surfing the web. VivoBook 4K users can also enjoy 4K/UHD clips and videos they’ve taken with the latest mobile devices and action cameras. ASUS VivoBook 4K has an ultra-wide 72% NTSC, 100% sRGB, and 74% Adobe RGB color gamut to give it exceptional color reproduction, something that’s rarely seen on mainstream laptops. IPS display technology provides wide 178° viewing angles to ensure no color shift even when viewing the display from extreme angles. ASUS Splendid technology corrects color temperature and optimizes visual settings to suit the task at hand. It has three preset modes — Vivid for movies and photos, Normal for daily productivity, plus Manual mode for¬ full user control. The exclusive ASUS Eye Care technology effectively reduces blue-light levels by 33 percent for a more comfortable viewing experience and reducing the instances of user eye strain and fatigue. Eye Care mode can be activated via a desktop app. 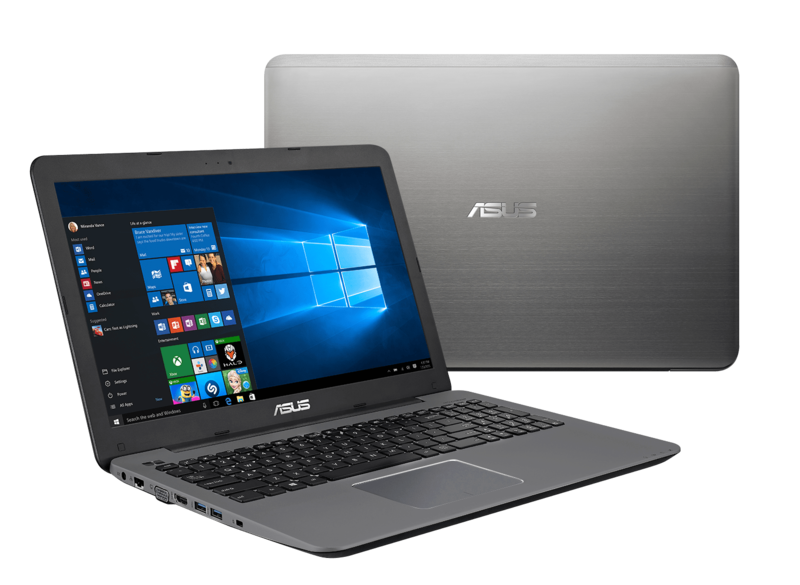 ASUS VivoBook 4K is powered by up to a 5th- or 6th-generation Intel Core i7 processor and NVIDIA GeForce 940M graphics. It has 8GB RAM, with expansion slots for up to 12GB RAM. Users can choose between up to 2TB of hard drive storage or upgrade to a solid-state disk (SSD) for faster data access. VivoBook 4K also comes preinstalled with Windows 10, making it a perfect platform for daily computing and 4K/UHD entertainment. ASUS VivoBook 4K has a premium brushed-metal construction and is available in four elegant colors – Icicle Gold, Glacier Grey, Black, and Navy Blue. The keyboard is surrounded by durable sand-blasted metal surfaces, while the power button features our iconic spun-metal finish.